The backstory to squeezing a gigantic Cuisinart box under the plane seat in front of me goes like this: for my mother’s 50th birthday, I thought it would be a lovely idea to buy her an ice cream maker. Yes, she had requested it several months earlier while flipping through a Williams-Sonoma catalog, but it was also partly a selfish purchase—ice cream is quite possibly my favorite food. Field trip to Santa Cruz for cheap sushi? Three scoops of green tea. Burrito lunch after harvest? A hefty arroz con leche ice cream bar. I marked the end of every college finals season with a pint, asking the cashier for a plastic spoon so I could start eating on the 5-block walk back to my dorm. I may forgo the last slice of cake or the final cookie in the jar, but with ice cream I always go in for the last bite. 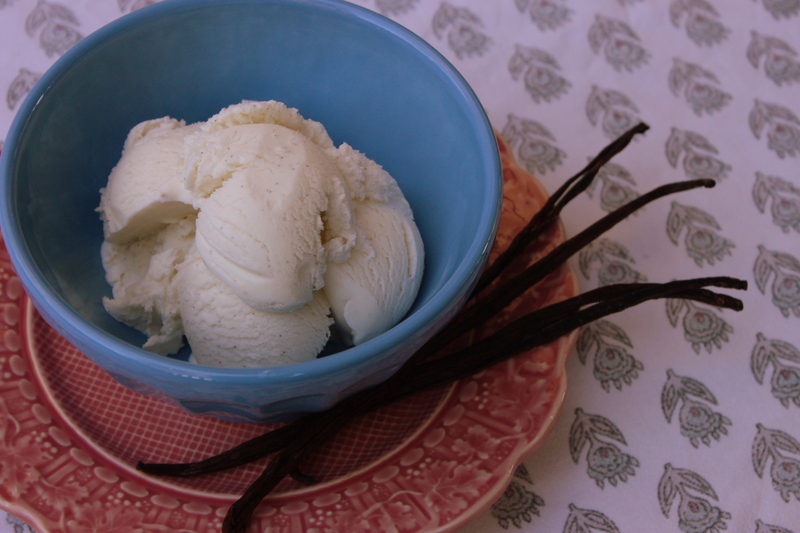 I’ve done homemade ice cream before, usually following the traditional custard recipe of eggs, sugar, cream and milk. It was good (what homemade ice cream isn’t?) but recently I came across a book in Bookstore Santa Cruz that made me reconsider my relationship to Ben & Jerry’s Americone Dream. Jeni’s Splendid Ice Creams at Home features recipes for Goat Cheese Sour Cherry and Salty Caramel, but most interesting were her basic ingredients: milk, cream, sugar, corn starch and cream cheese. Add a mahogany vanilla bean from Madagascar (courtesy of our good friend Sandy) and an enormous stick of cinnamon, and you have perfection worthy of making 20 pounds of brushed steel airborne. 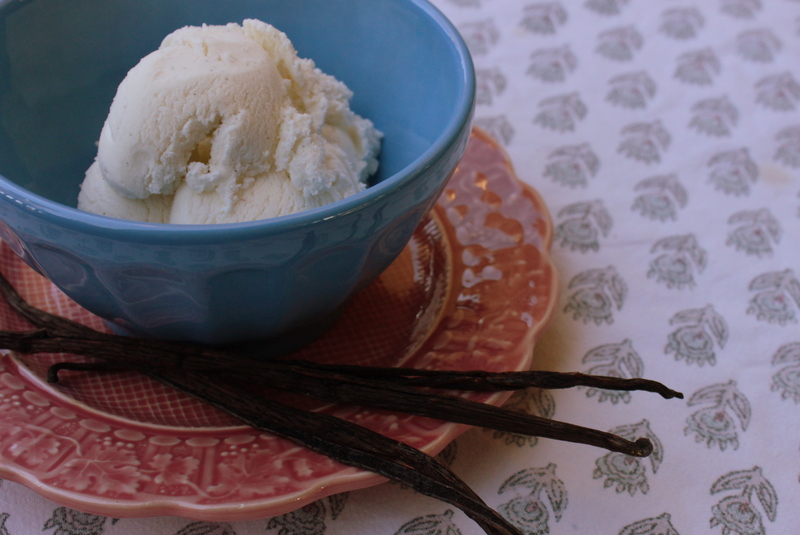 Adapted from Jeni’s Vanilla Bean Ice Cream. Combine the cornstarch with two tablespoons of milk in a small bowl. In another bowl, whisk the cream cheese until smooth. In a saucepan, mix the remaining milk with the cream and add the sugar, cinnamon stick and vanilla bean with seeds. Bring the mixture to a boil over moderate heat, then turn off the heat and add the cornstarch mixture. Return to a boil and cook for a minute or so until slightly thickened. Whisk the hot milk mixture into the cream cheese until combined. Add the salt and let the ice cream base cool until the bowl is cold to the touch. When cool, remove the vanilla bean and cinnamon stick and freeze in your ice cream maker (a worthy investment, let me tell you! ).